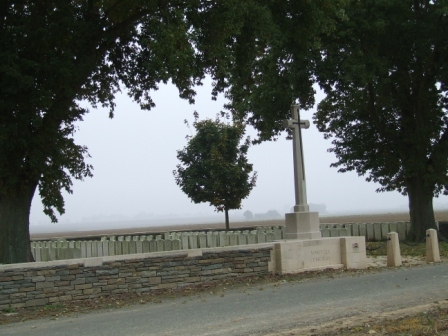 Manitoba Cemetery, Somme, France, where Frye’s brother Howard (killed in action 18 August 1918) is buried. It is worth noting that Canada’s last known First World War veteran died just this past week — John Babcock, who enlisted at age 15 and died aged 109. Peter, I don’t by any means think that Frye’s biography explains the general absence of attention to war stories in his writing, but his own painful experiences might have caused him to cast his glance elsewhere. I think the only time Frye glanced at war from the Nazi point of view was in his review of Ernst Jünger’s On the Marble Cliffs (reprinted in Northrop Frye on Modern Culture), but it’s clear that he doesn’t know quite what to make of Jünger’s allegory. Some of our friends have objected to our taking a holiday in a Fascist country, feeling that we ought to spend our handful of vacation money in those noble, generous, brave spirited, free republics, Great Britain and France. Well, perhaps. Certainly at Sienna, where we had an air raid practice and a blackout, we began to get restive at being in an officially hostile country with the papers all hermetically sealed against news. “La politica non è serena,” as our landlady said. But surely away up on this mountain, breathing this free mountain air (one of the voices of liberty, according to Wordsworth, who ought to have known), we can forget about Mussolini for a few hours. This entry was posted in Bob Denham, Literary Criticism, Memoir on February 28, 2010 by Bob Denham. I don’t know how much of Hemingway Frye read. He owned copies of Across the River and into the Trees, A Farewell to Arms, and The Sun Also Rises, and he reviewed the first of these for the Hudson Review (1950–51). My guess is that Frye had read Undertones of War, poems by his Oxford tutor Edmund Blunden; in any event, he owned a copy of Blunden’s book. Yes, I think it is easier for us to remain more detached, not having experienced war first-hand. I was trained to be an air defense battery commander in the mid 1960s, but during those days that the war in Vietnam was escalating, I spent my two years at a desk job at the Air Defense School in Ft. Bliss, Texas. When my father was in the Pacific theater (mostly Peleliu and the Solomons) in WWII, he wrote to my mother every day. The letters reveal very little about the horrors of war, and the invasion of Peleliu was one of the bloodiest of the all the fighting in the islands. He served in the Seabees, and so was not himself in front line combat, but he does drop his guard at one point and say “War is hell.” I suppose his silence otherwise about all of the killing was to protect my mother from anxiety. I never heard him say much of anything about the war: he kept it all within himself. My father, incidentally was also in World War I. He enlisted on his 20th birthday, trained in California to be a pilot in the Army Air Force, but happily the war ended before he was to go to France. He was discharged on his 21st birthday, 18 December 1918. Also, regarding what may be a renegade false memory of a photo of Frye and his brother: Does anyone recall seeing a photo of the young Frye riding piggyback on his uniformed brother’s back? Ominously, neither Bob nor Germaine Warkentin remember ever seeing it. I think I may have seen it once years ago in a Globe and Mail article or review. Does this sound familiar? Your father’s experiences and reactions to them sound very like those of my grandfather, Harry Aldridge, in WWII. Harry was a tank driver with the BEF, stationed in North Africa and India for training, then sent to the big fight in Rangoon. He served under Mountbatten, for whom he expressed nothing but contempt–60 years later! I visited him in England a year before his death in 2005, and he told me about his war experiences–very reluctantly and in little fragments–after being silent about it all of my (and I think most of his) life. Each anecdote would end just at the point he entered Burma, i.e. the fray, and the only sense I can get of what he might have experienced there comes from my reading on the subject. Thanks for posting those references to Frye’s reviews and comments on war literature. Some great leads there. Michael: I wonder, was Eratus pronounced with a long “A”? That might explain “Eraytus” if some enlistment officer wrote the name down phonetically from hearing it spoken. Peter, re: Eratus — according to Bob Denham, yes, the “a” is long. Howard was named after an uncle known as “Uncle Rate.” I’m guessing you’re right: that the enlistment officer or some such person added the “y” based upon a phonetic spelling and the error was perpetuated. Again, the name seems to be rare, rarer even than the relatively more common “Erastus”, which perhaps accounts for the (apparent) recording of the name as “Erastus Howard Frye” in the church record (this is unconfirmed; I can only say that the person who transcribed from the record and posted it on the web reproduces it as “Erastus”). John Ayre describes Frye’s parents as being ‘brutally crushed’ by the news of Eratus Howard’s death. “But the loss of Howard cut so deep that to the end of her (Cassie’s) life, she often wrote letters to relatives close to Howard’s birthdate, March 29.” For Frye’s father, Herm, “Thereafter, the sight of military uniforms made him agitated, even furious.” “For Northrop, who’d just turned six, the death of his brother presented a complex of confusions he was too young to comprehend. He had only a dim recollection of his brother as an amiable good-looking soldier in uniform who headed off to war when Northrop was still only four. But in the long term, Howard’s death had major repercussions for him because he became Howard’s replacement without the luxury of being allowed Howard’s conventional boyish interests.” (p. 29) I believe Ayre also describes, in a passage I haven’t located, Cassie not being able to fully see or pay attention to Northrop after his brother’s death, she was so wounded. A few years ago the Frye Festival helped erect and fund a tombstone at the gravesite of Frye’s mother Cassie, in the Elmwood Cemetery in Moncton. We listed all her children and where they are buried. We used Eratus Howard Frye as the spelling for Frye’s brother, as does Ayre throughout his biography. I wonder how it’s spelled in the cemetery in France. (Moncton, New Brunswick – November 1, 2004) – Friends of the late Northrop Frye have found a unique way of paying tribute to the former Moncton resident, considered one of the 20th century’s great thinkers. A group of Frye’s acquaintances and supporters from across Canada, the United States and Italy recently purchased a new headstone for Frye’s mother’s gravesite, located in Moncton’s Elmwood Cemetery. The headstone also lists other deceased family members as well as Frye himself, making it an important Canadian heritage landmark. The headstone will be unveiled to the public during a ceremony at 11 a.m. Tuesday, November 2, at Elmwood Cemetery on Elmwood Drive. “I think Norrie (Northrop Frye’s nickname) would have been quite pleased,” said Alvin Lee of Hamilton, Ont., one of those who contributed to the headstone purchase. Lee is past president of McMaster University in Hamilton and currently general editor of the 33-volume Collected Works of Northrop Frye project. Northrop Frye was born in 1912 in Sherbrooke, Quebec. At the age of seven, he moved with his family to Moncton. Frye left the city in 1929 to study at the University of Toronto, where he remained as a student and teacher most of the rest of his life. Frye authored three of the most influential books of literary criticism of all time. He was a pre-eminent English scholar and a noted commentator on Canadian society and culture. The idea to purchase the headstone for Frye’s mother originated after the scholar’s last visit to Moncton in the fall of 1990. During that trip, Frye and his wife, Elizabeth, visited Elmwood Cemetery and noticed that the gravesite of his mother, Catharine (“Cassie”) Mary Maud Howard Frye, was not well marked. (Cassie Frye died in 1940 at the age of 70.) Frye told Serge Morin of l’Université de Moncton – who also went to the cemetery during that visit – that he would like to acquire a new headstone for his mother. But Frye died a few months later. Two years ago, Ed Lemond and others on the board of directors of the Northrop Frye International Literary Festival spoke with some of Frye’s friends, including Alvin Lee, about the headstone. As a result of continued widespread interest in Frye’s works as well as his personal life, many felt that it was important to proceed with the headstone project. Lee made an early promise of financial assistance and, when it came time to complete the project this summer, sent a notice to his wide network of “Frye friends” asking for the additional funds necessary. In addition to Lee and the board of directors of the Northrop Frye International Literary Festival, North Americans who contributed to the project include Michael Dolzani, Germaine Warkentin, Jean O’Grady, Robert Denham, Nella Cotrupi, Bernard Imbeault, Monique Imbeault, David Hawkins, Lorrie Bell Hawkins, Brigitte Robichaud, James Lockyer and l’Université de Moncton. Two others from Italy assisted in the project: Branko Gorjup and Francesca Valenti. Paulette Thériault, Founding Director of the Northrop Frye International Literary Festival, said the tribute to Frye’s mother – and family – has significant value to the community. Thériault said many who attend the Festival are interested in visiting the sites where Frye spent much of his time growing up, such as the family home, local schools and his church. The new headstone was installed at Elmwood Cemetery in September. “Frye” is listed at the top of the stone, adjacent to the name “Howard”. Frye’s mother, Cassie, and her sister, Mary Gertrude Howard, were both buried at the cemetery. A former Alberta school teacher, Howard died in 1931 at the age of 56. The names of other deceased members of the Frye family listed below Cassie Frye on the headstone include Herman Edward Frye, Northrop’s father. He died in 1959 at the age of 89 and was buried in Chicago. Also listed is Northrop’s brother, Eratus Howard Frye, who was killed in action at Amiens, France in 1918 during the First World War. He was 19. He is buried in the Manitoba Cemetery at Caix, France. Northrop’s sister, Vera Victoria Frye, died in 1966 at the age of 65 and was cremated in Los Angeles. Northrop Frye himself, whose full name was Herman Northrop Frye, died on Jan. 23, 1991 at the age of 78. He was buried in the Garden of Remembrance at Mount Pleasant Cemetery in Toronto. “I’m delighted that Ed (Lemond) and the (Festival) board have carried through with this (headstone) project,” said Alvin Lee. Lee said he looks forward to seeing the headstone when he visits New Brunswick next April for the Northrop Frye International Literary Festival. A new headstone honouring the mother of Northrop Frye, one of the country’s greatest literary scholars, will be unveiled this morning in a cemetery in Moncton. Frye, the author of seminal texts including Fearful Symmetry: A Study of William Blake, The Bush Garden: Essays on the Canadian Imagination and The Great Code: the Bible and Literature, was born in Sherbrooke, Que., in 1912, but grew up in the New Brunswick city. His earliest learning came from his mother, Catharine (Cassie) Howard Frye, who taught him to read and play the piano by the time he was three years old. After graduating from high school, Frye took a business course — he was a champion typist among his many other accomplishments — and enrolled in Victoria College at the University of Toronto in 1929. Although he was later ordained as a minister in the United Church and preached briefly in Saskatchewan, Frye’s true vocation was as a teacher and a literary critic. He earned an MA from Merton College at Oxford University in 1940 and spent the rest of his distinguished career at U of T.
On what would be his last visit to Moncton in the fall of 1990, Frye and his second wife Elizabeth visited his mother’s grave in Elmwood Cemetery. The grave was not well-marked and Frye remarked to Serge Morin of the University of Moncton that he would like to acquire a new headstone for his mother, who had died in 1940 at the age of 70. Unfortunately, Frye himself died a few months later, on Jan. 23, 1991, and was buried in Mount Pleasant Cemetery in Toronto. “I think Norrie [Northrop Frye’s nickname] would have been quite pleased,” said contributor Alvin Lee, past-president of McMaster University and general editor of the 33-volume Collected Works of Northrop Frye project. The headstone, which lists Frye and other deceased members of his family, was erected in September. Paulette Thériault, founding director of the Frye festival, feels the headstone is “extremely important” as a heritage landmark. “Frye’s legacy is vital to Moncton, to Canada and to the world,” she said in a statement. Eratus Howard Frye, Northrop’s older brother was named after his mother Cathatrine”s father, Eratus Seth Howard (b:1832). I descend from Catharine’s brother Daniel Hersey Howard, and my grandfather Wilbert Howard was Northrop’s first cousin. As the family archivist and genealogist I possess what I suspect is the very first photo of infant Northrop, and have others from his youth, mostly in family gatherings I have traced his Howard ancestry back many generations. If anyone is interested, let me know..